One-sectioned welded cabinet with removable side panels. High quality workmanship and up-to-date technology ensure a perfect look of the cabinet. The hinge system allows the door to open almost 180°. The door can be easily removed and re-mounted to change the direction of opening. It enables an easy and quick access into the cabinet. Two pairs of vertical 19“ rails are freely adjustable in any depth of the cabinet. This simplifies mounting of the device and organisation of connecting cables. The cabinet has fully glass door in standard. It can be steel or perforated if required. Cable openings covered with breakout-type blanking panels are ready in the top, bottom and rear part of the cabinet. In the supply, there is a fringe edge and a blanking panel with a brush to seal the cabinet opening against dust penetration. Removable side panels enables easy access to the installed devices from the side. 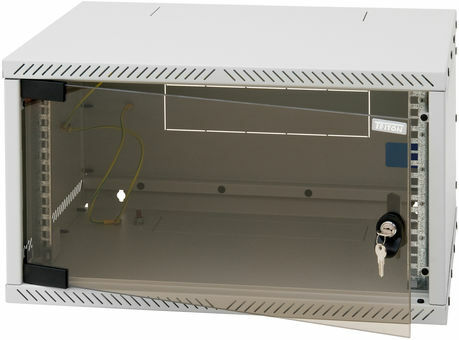 The RUA type has 6 break-out blanking panels for the installation of ventilation units RAx-CH-X2x-X1 or fans RAX-CHX07-X9 (up to 3 in top and 3 in bottom part of the cabinet). RUA therefore enables installation of devices that in the past could not be cooled sufficiently in wall-mounted cabinets and had to be installed into free-standing cabinets only.